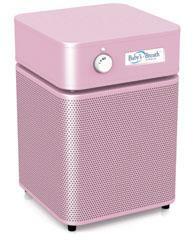 The Baby’s Breath™ offers the highest level of protection from a variety of airborne contaminants, ensuring your baby receives the cleanest air necessary for proper development and growth.In addition, the Baby’s Breath™ creates a gentle hush resembling the familiar sound your baby enjoyed for nine long months in the womb. This soothing white noise is clinically proven to help infants fall asleep more easily and sleep more soundly. If you don’t see a difference in your baby’s life, return it for a refund within 30-days. The Baby’s Breath™ addresses the complete spectrum of air cleaning, removing sub-micron particles, noxious gases and chemicals. Every minute, The Baby’s Breath™ draws over 125 cubic feet of air through a 4-stage HEGA filter containing Activated Military Carbon Cloth and over 30 square feet of True Medical Grade HEPA. The result, more clean air delivered faster and more efficiently than any other air cleaner on the market.